The book is very patriotic in tone, a fact dictated by Hughes’ recent appearance before Senator McCarthy’s Subcommittee, which exonerated him on the condition that he renounce his earlier sympathies for the Communist Party and get with a patriotic program. 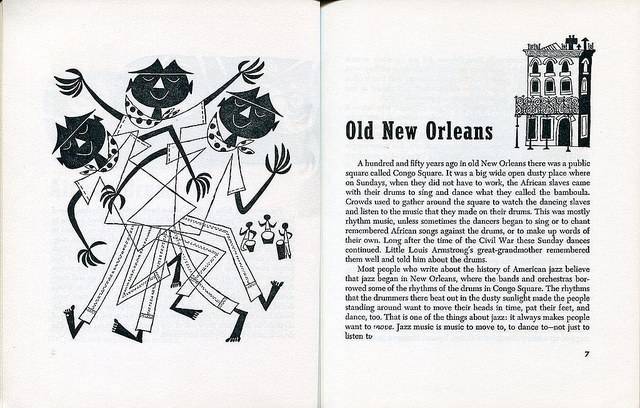 Having fallen out of favor with the public, Hughes began the nonfiction children’s series to win back readers, also writing the quaintly named cultural history First Book of Negroes and the Whitmanesque First Book of Rhythms. All of the books were illustrated by different artists. 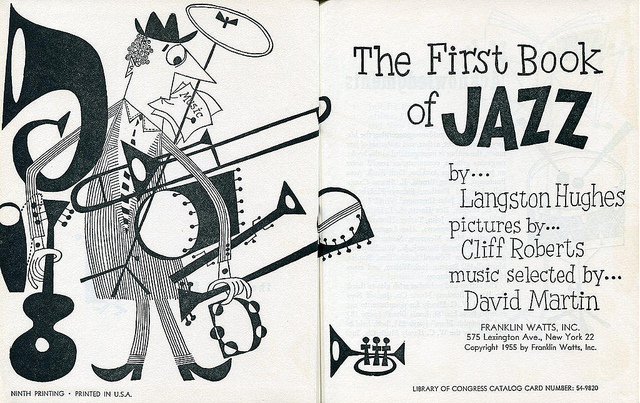 The First Book of Jazz received special treatment from popular illustrator Cliff Roberts, who made its pages closely resemble classic album covers by artists like Jim Flora. A part of American music is jazz, born in the South. Woven into it in the Deep South were the rhythms of African drums that today make jazz music different from any other music in the world. Nobody else ever made jazz before we did. Jazz is American music. 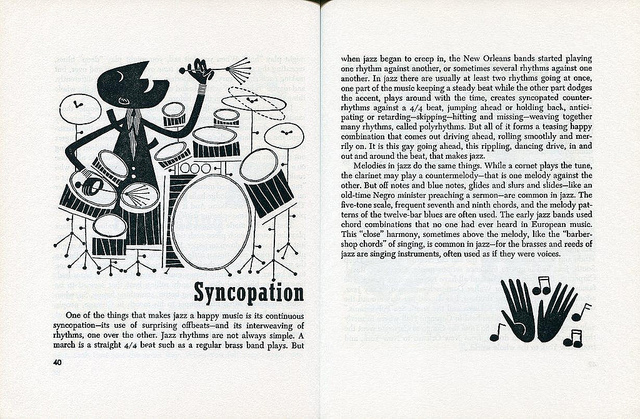 “The particular Americans in question,” writes Winter, “are undeniably black,” and “when Hughes covers the vast array of American styles that went into jazz, they tend to be (as they should be) black interpretations of each musical form.” But as he had always done, whether under pressure from McCarthyism or not, he proudly declares jazz yet another invaluable contribution African-Americans, as well as European immigrants, made to the national culture. However far left his political sympathies, Hughes was always a patriot, in the best sense, an admirer of his country’s achievements and genuine lover of its people. 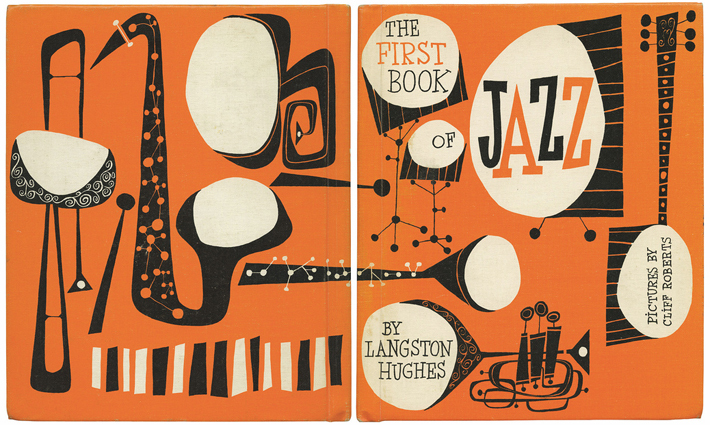 Although it is a children’s book, Hughes’ First Book of Jazz is still a scholarly one, with a host of references in the Acknowledgements, and a list of famous jazz musicians, and their instruments, at the end. Also rounding out the short course on jazz history and musicianship is a two-part list of “Suggested Records for Study” and one called “100 of My Favorite Recordings.” Hughes even convinced Folkways records to release The Story of Jazz, an LP Hughes narrated with examples of each style of jazz he discusses. 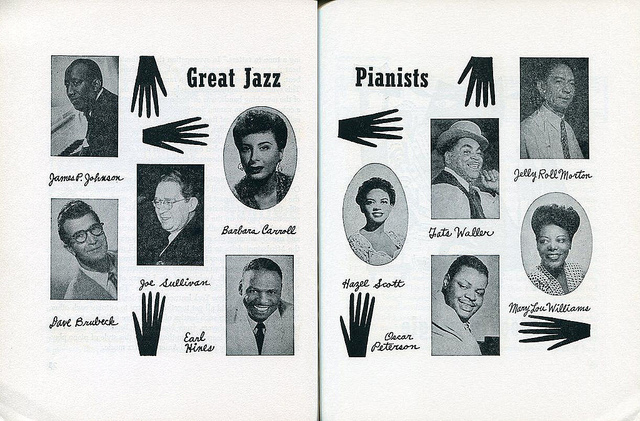 You can read the full First Book of Jazz at Winter’s Flickr, where he has posted scans of every page. See a gallery of Roberts' full page illustrations here. The preceding link is just an example of a very irritating editorial format here. Psst! Many of us actually do prefer to read print on paper and the last thing any of us want is to have to print 20 pages!!! of irrelevant commentary just to print a one page article. This is especially true for writers and researchers who keep hard files. So please give us, out printers, our paper, out toner, and the planet a break and get green already. Finally, your CAPTCHA code is absolutely infuriating!!!!!!!!!! The point of the post was not to present the book in its entirety. Not at all. It was more to give you an introduction to the book (to make you aware of its existence) and to give you a feel for its illustrations. If you would like to get the book in a neat, nice format on paper, I have a simple suggestion for you: buy the book. Good point Dan. People seem to think everything should be free. Yes, save yourself all this angst and buy the book. I loved the post and love the book. I just bought one. thanks for turning me on to it!